DEVO in Energy Domes on front -- illustrated by Scrojo. Club DEVO bomb logo in yellow on back. Printed on royal blue tee. 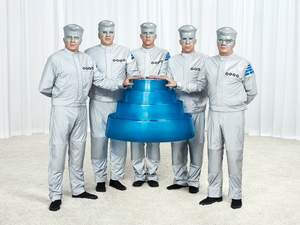 Classic DEVO mantra "Duty Now For The Future" paired with fresh full-color graphics for a new era. Genetic mishap... Devolved comrade... or both? Either way, we're all Devo. DEVO's iconic Energy Domes have been integrated into the design of these exquisite retro DEVO Headphones... made to channel a mix of quality audio & hearty orgone energy to your head. Tech Info: Speaker Diameter: 50MM / Magnet Type: NdFeB / Impedence: 32ohm / Frequency: 18-20,000 hz / Max Input power: 100mW / Cable Type: OFC m / Cord Length: 1.2M / Plug type: Gold plated. Official DEVO in-ear buds... featuring the Something For Everybody, blue, Energy Dome logos on each. Tech Info: Driver 10mm / Impedance 16 ohm / Freq 20 to 20K Hz / Cord Length 1.2 meters / Plug Material Gold Plated / Compatible with all iPods, iPhones, and MP3 players.